There are a few things I love about waking up in the morning. One of those things, is that my calorie count starts all over, so it’s a clean slate. I get to decide exactly what I want for breakfast….I love so many breakfast foods; oatmeal, eggs, smoothies, and PANCAKES. 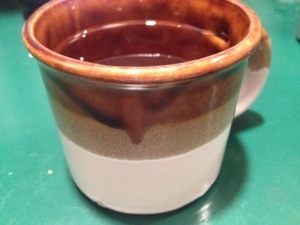 The other reason I like to get up is my cup of coffee. Well, it’s more like cream and coffee, in that order. I love Coffee-mate Sweet Cream flavored sweet creamer. I have a Keurig, that I also love, because I am a one cup of coffee person. This is for many reasons. One, in my old age, I have become more sensitive to caffeine. Second, I am counting my calories, and with my creamer addition, I don’t like to use too many calories on my cup off coffee. The bottom one is my favorite. It is short and wide. So, it fits into the Keurig very well, and then has room for me to add my delicious creamer!!! Yummm…the calmest part of my day. Today was a day where I felt like I didn’t get a minute to take a breath and realize what was going on. I hate that. When I can’t remember looking a student in the eye and having a conversation with them. I know I told kids I would do things that I never got done, and I was very impatient. I suppose some days are like that. And the kids will forgive me. That’s the best part about working with kids. They are so forgiving, and willing to overlook your flaws. Tomorrow is an inservice, and it ends at noon. Woo hoo!! Looking forward to a Friday afternoon off. 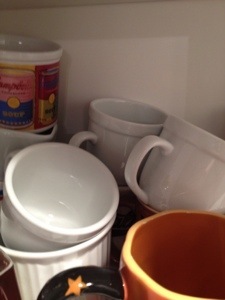 This entry was posted in Uncategorized and tagged coffee, creamer, mugs. Bookmark the permalink. 4 Responses to I play favorites. so many things to comment on…. 1. I had a great 2 weeks of dieting, and have fallen off the past two days. Thanks for the reminder that i CAN start fresh tomorrow. START OVER. CLEAN SLATE. 2. I too LOVE my morning coffee. I too only have one cup b/c I feel crappy if I have more than that. I too love cream in my coffee but prefer straight up heavy cream. what’s your fav keurig cup flavor right now? Sometimes the last thing i think about at night, is my cup of coffee first thing in the morning. 3. I am sorry you had a rough day…..half day Friday tomorrow! Have a good weekend. Me, too!! I go to bed thinking about my morning coffee. I am th same way. I love Almod Joy creamer so much and sometimes I can already taste it the night before! I love Almond Joy creamer, too. Coconut rules. But, Sweet Cream is my favorite.